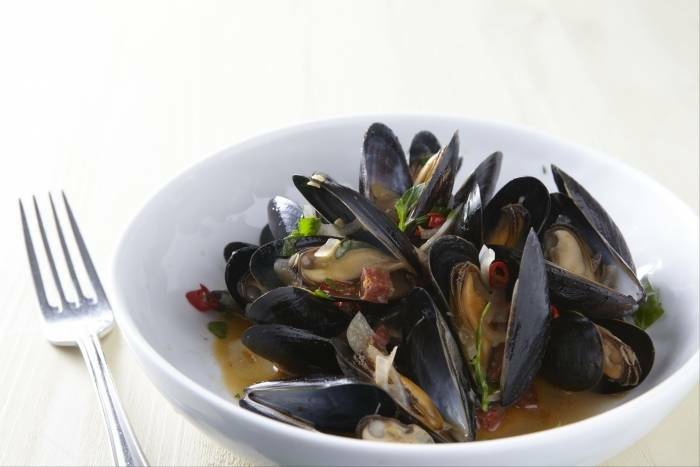 Wash the mussels in cold water and remove the beards. Check the mussels are closed tight and alive. Finely dice the chilli. Remove the skin form the chorizo and cut into cubes. Heat the oil in a large saucepan and saute the chorizo and shallots for 5 minutes. Add the garlic and cook for 1 minute. Add the mussels, sherry and bay leaves. Put a lid on and cook for 2-3 minutes until all of the mussels are open. Finish the dish with the red chilli and chopped parsley. Serve immediately with some crusty bread.